Be safe, keep other drivers aware of your propensity to slowly weave out of your lane as you go chasing birds by car. It's okay, if you've got one of our bumper stickers or license plate frames on your vehicle, everyone will cut you some slack. Who doesn't love an absent-minded birder on the road?! 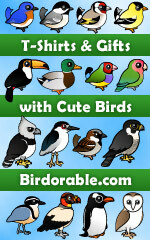 These designs were made just for your "bird-mobile" (and are not available elsewhere in our shop). We do have a huge selection of other bumper stickers with more of our birder designs throughout the store. You can find them all by clicking on the links below.